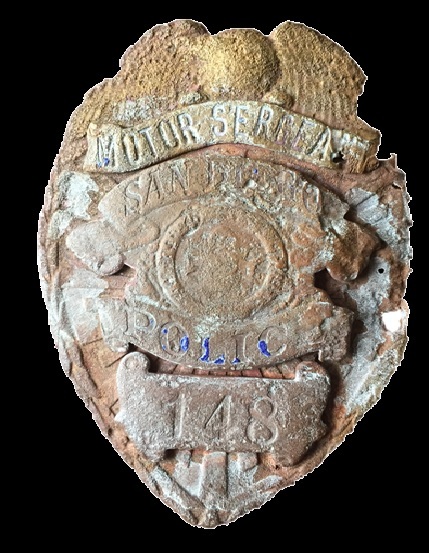 Around 2005, a rusty San Diego Police badge was found on a public beach in Oceanside. A citizen unearthed it then flagged down a police officer. The badge was ultimately donated to the San Diego Police Museum. 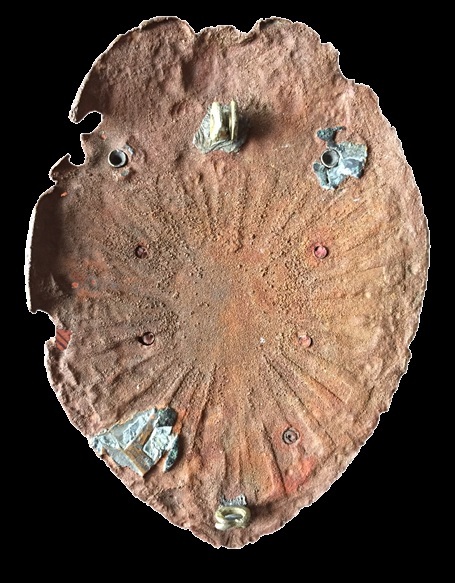 The badge was quickly determined to be beyond repair however two elements made it exceptionally rare. Look carefully at the badge. The centerpiece that reads "San Diego" just over the city seal is a part of the seal itself. The reverse of the badge is a "Shellback, rivet design." Both are indicative of a pre-1935 San Diego Police badge. Despite the very rough condition, the very rare rank rocker made it worthwhile to keep and the number made it identifiable. The only issue was locating who owned it. Finally, in 2014, the number was linked to Motorcycle Sergeant James Gilchrist. How the badge wound up buried in the sand on an Oceanside beach will forever remain a mystery.